She Reviews: L’Oreal Paris ‘Go Purple’ anti-brassiness shampoo | SHEmazing! Being blonde has it's perks, but staying blonde is another story altogether. From maintenance to conditioning to frizz, bleaching your hair blonde brings annoyances alongside the shimmering golden fierceness. Watching those dark roots emerge while checking your bank balance and realising that you can't afford to get them bleached professionally is a special kind of heartbreak. Otherwise known as the purple shampoo GODS, I was stunned at how amazing the results are. It does dry out the hair, but it's worth it if you pair it with a good conditioner, or use Olaplex. Olaplex has saved my bleached barnet by using specialist chemicals to legit bind the hair together and protect it from the damage of bleach. The salon Cowboys & Angels on South William Street in Dublin SWEAR by it, and for good reason; It really does work. I've tried using 'big brand' or high street purple shampoos, and normally they're an absolute train-wreck. Their bleach and toners are a pure mess, NEVER use them. Always go to the profesh gals for bleaching your hair; the cheap ones in Boots will just damage your gorgeous locks and you'll have to pay to fix it anyway. As someone who had to purge my hair three times to have green hues removed, it's always an imperative idea to go to the salon. John Frieda, I'm looking at you. Bleach London, y'all need to do some WORK. So I was extremely sceptical when I tried L'Oreal Paris Elvive' new purple shampoo. Only the professional salon brands like Fanola normally work, but I was hugely impressed by L'Oreal Paris Elvive's efforts. Their new campaign is fronted by none other than Helen Mirren, and they have vowed to banish yellow hues. Purple formulas, often called silver shampoos, are used on white, silver and dyed blonde hair to keep them looking fresh and light coloured. Purple is the opposite to yellow on the colour wheel, and works to cancel out the sunny tones. I should mention, my hair was bleached blonder than it's natural dark blonde tone, then a silver/lilac toner was used. My toner unfortunately allows pink shades to seep through, but after using L'Oreal Paris Elvive's purple shampoo, the hair was noticeably less pink. I wanted lilac realness and I got it, so it's a job well done in my eyes. My hair also didn't feel as dried out, after pairing it with the matching L'Oreal Paris Elvive Purple conditioner. It's only necessary to use purple shampoo once a week, and leave it in the hair for one to three minutes for excellent results. While still no match for Fanola, my hair has returned to a more lilac tone rather than unwanted yellow and pink. I would 100 percent recommend the shampoo for bleached blondes, or even highlighted brunettes, as it's far cheaper than Fanola. Cowboys & Angels sell Fanola's purple shampoo relatively cheap compared to it's marketed price, but you'd struggle to find their no yellow shampoo online for under €20. 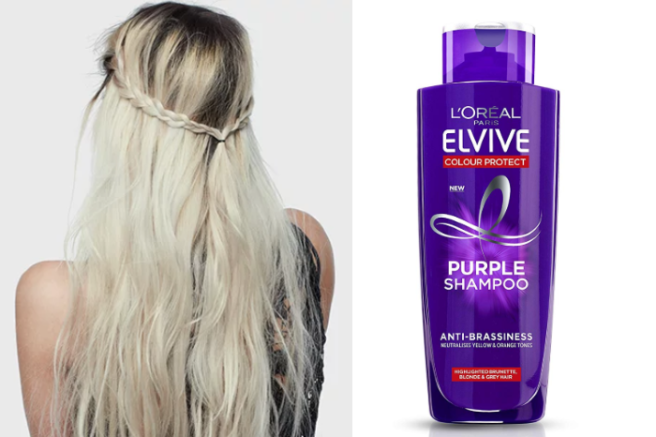 At €8.95 each for the shampoo and conditioner, L'Oreal Paris Elvive allows you to get blonder on a budget. If Helen Mirren is on board, then by GOD so are we; She can do no wrong. Overall, L'Oreal Paris Elvive Go Purple gets four stars out of five stars from us. Great value without any damage to the hair, and decent blonde results.